Jia Renda’s Kung Fu was just average, but his character was even worse. His Master was never fond of him, and even his fellow apprentices looked down on him. So, when he heard Fang Renzhi’s words, he didn’t dare kick Lin Pingzhi again. Instead, he spat at Lin Pingzhi to vent his anger. “Let’s eat something first before we start our trip. Junior apprentice Jia, go cook us something, will you?” Fang Renzhi commanded. “Sure,” Jia Renda answered in compliance. “Senior apprentice brother Fang, we have to be careful not to let these three escape. The old one’s Kung Fu isn’t half bad; we’ll have to figure something out,” Yu Renhao mused. “One more word out of your little rascal’s mouth, and I’ll find some cow dung or dog crap to stuff your mouth with.” Fang Renzhi threatened him with a wolfish grin. These words silenced Lin Pingzhi, although it made him almost pass out with rage. He shut his mouth immediately and did not dare say another word. Lin Pingzhi wanted more than anything to get up and fight Fang Renzhi and Yu Renhao to the death, but with several of his acupoints sealed, he was unable to move any muscle from his lower body. He would become a complete invalid if they were to cut the nerves and tendons of his limbs and thread him through the collarbone, and he would rather die fighting than go through all that pain. It was a long cry filled with pain, and it was the voice of Jia Renda. Fang Renzhi and Yu Renhao both jumped up with their swords drawn and dashed into the kitchen immediately. A shadow flashed by the door, and a person glided in silently, then grabbed Lin Pingzhi by the collar and picked him up. Lin Pingzhi cried out in surprise when he caught a glimpse of the pox-covered face of his rescuer: it belonged to the ugly wine-selling girl, who had caused all this trouble to begin with. The ugly girl dragged him all the way out the front door. When they reached the big tree where their horses were reined, she grabbed him by the back with her left hand and lifted him up onto the back of the horse. 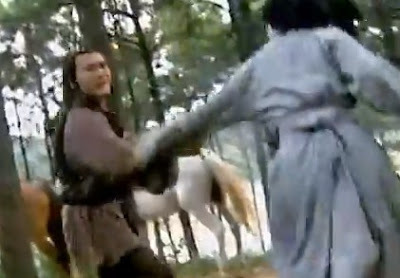 With Lin Pingzhi still in a state of shock, the girl pulled out a sword and swung it swiftly. The blade flashed and the rein was cut free. She prodded the thigh of the horse with her sword; feeling pain, the horse let out an angry neigh, and then pounded madly into the woods.